Alice Springs Chicken is the first thing I tried at Outback Steakhouse and I fell in love. It’s a yummy cheesy, bacon and mushroom delicious hot mess. 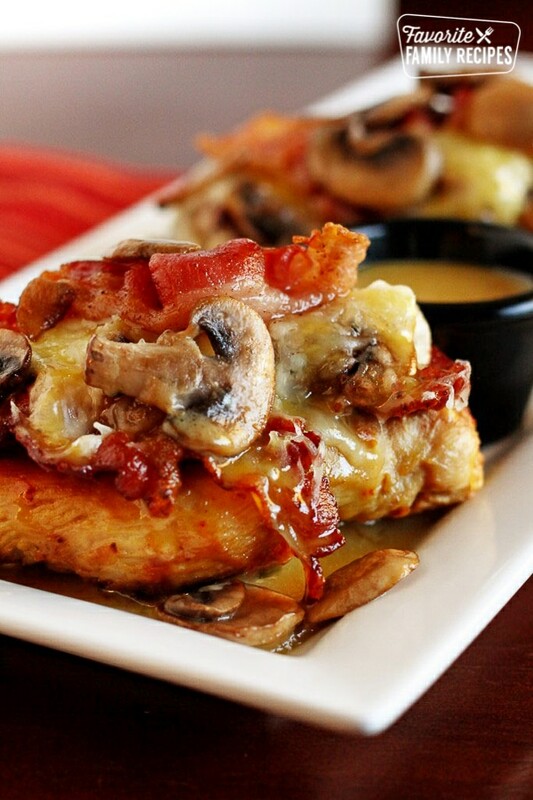 You will love our Alice Springs Chicken! The honey mustard marinade is so good, be sure to make extra so that you can reserve some for dipping the chicken in when you serve it. You are going to really like all the cheese, bacon, mushroom, and honey mustard flavors infused together and your family will love it too. You simply can’t go wrong with this chicken. If you would like to grill the chicken instead of pan-fry it… do it. It tastes awesome that way too! It will taste best if, after marinating, you bring the chicken to room temperature before grilling. Then grill over medium-high heat for about 6 to 7 minutes on each side- only turning once. Then add the mushrooms, bacon, and cheese and bake as directed in the recipe. We made our Alice Springs Chicken on KSL Studio 5 in Utah the year we released our cookbook. It was a HIT with Darin, one of the hosts of the show. He helped me put it all together– super easy! After the show we put it behind the scenes for the crew to try and they devoured it. Everyone raved about how good it was. This recipe is one of the 175 that we featured in our first COOKBOOK. We picked our very favorite recipes for our book, so that should tell you something about how much we like this chicken. This recipe is really good with our Potato Wedges or Parmesan Baked Potato Halves as a side dish. And for something a little on the lighter side, try it with our Berry Salad and Strawberry Balsamic Dressing. Alice Springs Chicken is the first thing I tried at Outback Steakhouse and I fell in love. It's a yummy cheesy, bacon and mushroom delicious hot mess. Use an electric mixer to combine the mustard, honey, mayonnaise, and lemon juice in a small bowl. Whip the mixture for about 30 seconds. Place chicken in a Ziploc bag and pour in about 1/3 of the marinade. Seal the bag and press out as much air as you can and marinate in the refrigerator for about 2 hours. Chill the remaining marinade until later. After the chicken has marinated, remove chicken from bag and discard the marinade that it has been soaking in. Preheat the oven to 375 degrees and heat an ovenproof frying pan large enough to hold all four breasts and 1 Tbsp. oil over medium heat. (If you don't have an ovenproof frying pan, transfer the chicken to a baking dish). We have so many delicious chicken recipes, it’s hard to pick a favorite. We like to get the big bags of frozen chicken and use it to make all kinds of dishes. You can find all our best chicken recipes HERE. If you like copycat restaurant recipes you are in luck! We have a big selection of restaurant favorites from sit down dining, to quick service, to fast food selections that you have got to check out. Find the full list HERE. Good and recipe and I can tell it is one of the finest dishes I want to eat right now. Thanks for sharing. Made this tonight, it was AMAZING! Thanks for the great recipe: I will be adding this to my rotation! I made this tonight for our volunteers. We all loved it. I had to make a couple substitutions because I am a ways from a grocery store and have to get creative with what we have most of the time. I replaced the Grey Poupon and honey with French’s Honey Mustard dipping sauce and replaced the Monterey Jack with mozzarella. I will definitely be making this again. My husband Looooved this! One of the best dishes I got off pinterest. Very happy! Walmart carries a sugar free honey….I eat lo carb and I use this all the time….its great. Its from Honey Trees and its where the honey is. Definitely agave syrup, maybe just use 1/2 c. and then some artificial sweetener equivalent to the other half. You’ll miss a bit of the honey flavor, but the other flavors are strong enough anyway! Diabetic products like : sugar free syrup of sweetener . I know agave is low on the glycemic index. I have seen a lot more sugar free products now on super markets selves. You an always google sugar free products and amazon is happy to deliver . and I tried to pin it with both the Pin It button on my brower and your pin it button on your recipe. Am I doing something wrong or is there a problem. It might be a problem with Pinterest at the moment. Usually either of those things will work! I have the same issue trying to save on Pinterest. It is not random, I tried to save another of your recipes last week and had the same problem. Where are you having the problem? Is it with the roll-over pin button on the pin button at the top of the recipe page? This is the ONLY think I order at Outback…thanks so much for the recipe can’t wait to try it! I made this the other night and it was so yummy! I did not make the marinade, as my kids would not like it. I bought a regular ol honey mustard in a squeeze bottle. We did our chicken on the grill and basted the HM on it, and I added some more before adding the toppings. It still tasted wonderful. I love your recipes! If it would be possible to print them without the big picture of the completed recipe that would be awesome. I put them in my Recipe Binder but the pics take up so much ink. I will check into this and see what I can do! Thanks for the input! Just copy and paste the words onto a word document and print……………. Copy the complete recipe and paste into WORD; while in WORD, go through recipe and enlarge print and delete picture; then you can print and/or save the recipe you want. We had this the other night and really liked it. May I suggest pounding the larger breasts slightly to speed the steps along? It definitely took more than “3-4 minutes per side”. Also, you can easily half the marinade amount. There’s way more than needed for the marinade, extra drizzling during cooking, and dip for meal. Lastly, next time I’ll crumble the crisp-cooked bacon and mix it at the last moment with the cooked mushrooms to make it easier to eat (bacon-mushroom-cheese-chicken in EVERY bite!). Lovely dish–thank you! I had the same issues with the chicken breasts being too thick but this came out wonderful and still tasted great reheated. We pretty much left your ingredient list intact. For those who want to use agave instead of honey, that is a really unhealthy substitution. You’d be healthier using HFCS, the fructose level in agave is upwards of 90 percent! That is higher than table sugar (50%) and HFCS (60%). That stuff is not “healthy” at all. Thank you! I am glad someone else realizes that agave nectar is not the magic potion everyone makes it.out to be! Made this tonight — looked just like the picture. Tasted divine! Thanks for sharing. Had this at a girls night last night and it was FABULOUS! Just as good if not better than the restaurant version….I will DEFINITELY make this for my family-SOON! This dish ROCKS!!! My hubby was hesitant at first, but the first bite he was sold. Great recipe, so easy – thanks for sharing! This was a big hit with my husband and me! I am glad I decided to try it, thank you for this great recipe. This was AMAZING!! Thanks for the recipe!! This was simply amazing, even my family loved it! Do you think that the marinade would be okay mixed ahead of time, or for the chicken to marinate all day? This is the best recipe I’ve made in a very long time. I marinated for 2 days—it came out incredible. Looks great. “Remove pan from heat but keep chicken in the pan. As the chicken is cooking” Is the chicken going to bake in the oven for awhile before the topping is added? Confused. You will do this step as you are searing the chicken for 3-4 min on each side. Or after it is removed from the heat. Erica! Stop making me fat 🙂 Jess made this for me on my bday the other week. It was so good she decided to make it for her cheat day this weekend. I am way excited! Another fabulous recipe. I’ve made this a couple of times and it’s definitely one of our family favorites now too! I like to use two chicken breasts that are cut in half horizontally to make four pieces. Then I flatten them slightly with a meat mallet so that they cook more evenly. Not only does this make the chicken go further, I like the ratio of chicken to other ingredients better. Also, if you’re in a pinch for time, you don’t have to marinate the chicken for this recipe to turn out well, it’s delicious either way. Thank you for sharing! Hi, I love this recipe. I just made this for dinner for my sister and mom for their birthday (Honey mustard chicken is my sister’s favorite). The only thing I would recommend that’s different is to cook the chicken in the bacon fat instead of extra oil. That way you’re only using one pan instead of two and you get an awesome flavor on the chicken!! Happy cooking! Great idea! I am sure that adds such a great flavor! Thank you for sharing! I have never tried this at The Outback but your recipe look simply scrumptious! I’ll have to try this some time this month! Thank you. Making this this weekend, can’t wait to try it out. It looks so delicious. Any ideas for a simple creamy but not too heavy sauce to drizzle over this and whatever veggies I decide to put with it? Are you looking for a dressing for cold veggies or a sauce for hot veggies? I found this recipe tonight, and decided to give it a go. I was quite impressed, it was delicious. Thank you for putting this together, myself, and my fiance loved it. So glad you both liked it! It is one of our favorites (and way cheaper than going out)! Oh my God!!! This is the best recipe ever!!! Will definitely make again! Thank you So much for the recipe!!! DELICIOUSNESS!!!!! So glad you liked it! 😀 Thank you! Can I freeze the raw chicken in the marinade to use later? You can if it is the first time the chicken is being frozen. That would be a great idea, actually! Hope this helps! This dish is AMAZING! I prepare meals at night for a family and this is a favorite! I use the thin sliced chicken breasts and grill them. Cuts down the cooking time by a long shot! I am so glad you like it!! Thanks for the 5-star rating! !